The Robbins Building an iron-front building by John Van Osdel commissioned by Allen Robbins for the city’s first iron structure. 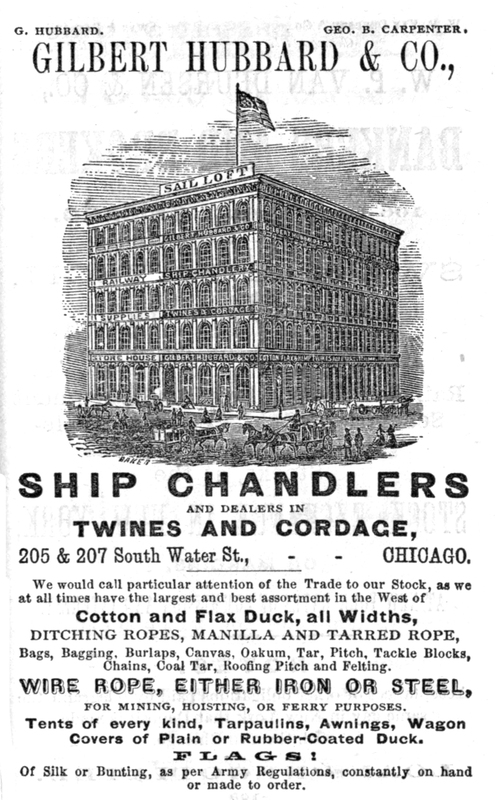 It was to be a combination of store, offices, warehouse at the SE corner of South Water (Wacker) and Wells streets, then one of the city’s busiest intersections. Little is known about Robbins. It is clear that he never intended to occupy the building but constructed it as a real estate investment. For Robbins’ building, Van Osdel selected a Renaissance style front with ten great round-arched windows extending across each floor of the Water Street facade and eighteen spanning each floor on the Wells side. The strength of the iron called for little more than the width of a fluted column between windows. With five stories of wide arched windows rising one tier above the other the nearly all glass surface must have glistened in the afternoon sun while allowing a flood of light to bathe the interior. Van Osdel employed a favorite architectural device at the time—he made each story shorter than the one beneath it. Some say this was to create the illusion of greater height, others allege that the lower floors commanded the highest rents and deserved the greater dignity afforded by high ceilings and spaciousness. The Robbins Building represented an advance in building technology in Chicago. The commercial new buildings that lined the business streets of American cities at this time typically had side and brick walls of common brick to carry the load of wooden beams, joints, and flooring. Slender cast iron columns supported the floors in wide-spanned interior spaces. The fronts of such buildings, whether made of stone or cast iron, supported themselves and nothing else. This was the case of the Rollins Building, which occupied a corner lot and therefore had two facades. In this instance the two iron fronts supported not only themselves, but also some of the floor loads and thus created, in effect, an exterior iron frame. This principal would later be more fully explored as architects experimented with ways ti build higher structure. Indeed, a contemporary version of an exterior iron frame can be seen in the John Hancock Building erected on upper Michigan Avenue in 1968. Painted a light color, it looked like a Venetian palazzo and was certainly a departure in scale, ornamentation, and lightness of appearance from the stone, brick and wooden commercial buildings of mid-century Chicago.